If you would like information on how to become a sponsor or a member, fill out this form and we will get back to you ASAP! Do you have the best burger in town? We'll be the judge of that. Join us in Downtown Tupelo for live music, lots of fun and the best burger-cooking competition around! Several categories are awarded, including professional/restaurant, Best in Show (based on theme) and People's Choice and new this year is the Secret Ingredient award! Wine Downtown is a progressive wine tasting throughout our participating downtown businesses, ending at Farmhouse for an after-party with delicious food and great live music. What better way to spend a Friday night than with a little shopping and "a little" wine? Tupelo Elvis Festival is a celebration designed to honor Tupelo’s native son, Elvis Presley, and the impact of his music. The festival music includes concerts by locally and regionally known artists in Fairpark, a Sunday Gospel Concert, and an Ultimate Elvis Tribute Artist Contest. In addition to all of the great music, the festival features a number of local food vendors, a pet parade, a 5K run, a pageant and much more! For more details, please click here to visit our website or our Tupelo Elvis Festival Facebook Page! To purchase tickets on or after January 23, 2019, please click here. Down on Main is a **FREE** summer concert series that occurs once a month in Fairpark during July, August and September. Down on Main is a great way for us to come together as a community while enjoying live music, good food and cold beverages. Ale Trail is a progressive craft beer tasting with stops in our shops throughout Downtown Tupelo. Start your night by picking up your tickets at FNB Bank, then shop around with our participating merchants. End your night at Farmhouse with an after-party! Everyone's favorite chili cook-off is back, and there can only be one winner! Ok maybe not... teams compete against each other in a number of prize categories, including best recipe, team spirit, best costumes, most creative tent and most original theme. Don't have a team? Throwing one together is easy - grab your friends, family, coworkers, anybody! Attendees can come at both lunch and dinner - tickets are sold at the gate upon entrance. You get to eat a bowl of delicious chili, then sample each team's recipe, all before casting your vote for People's Choice. As if that wasn't enough, there's beer and live music to make it the perfect Friday night! Formerly known as Pigskins in the Park, your favorite tailgating experience is back! Join us in Fairpark as we have a rib cook-off while we screen the Mississippi State away game, as well as the Ole Miss away game. It’s all FREE! Want to compete? There are only 16 spots, so act quick! Click here to see all the rules, regulations and judging criteria. 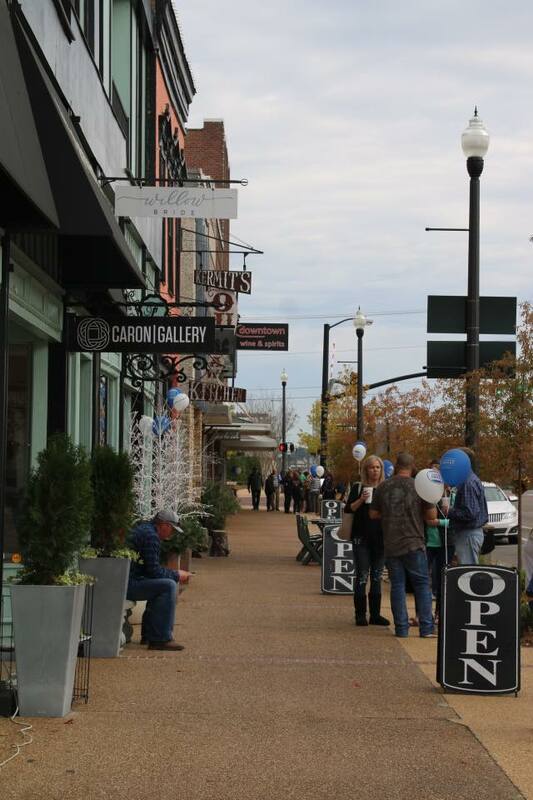 There's no better way to welcome you into Downtown Tupelo than by opening our doors and inviting you in to shop with us during open house. Shop special sales, maybe grab a snack or two, and enter to win an amazing gift basket each participating store contributes to! Open house is just another way we say, "Welcome!" Each year, the Saturday after Thanksgiving, local businesses like to celebrate Shop Small Saturday. This is a national movement, and on this day we encourage everyone to shop small! Shopping in Downtown Tupelo is the best way to give back to your community. Join us on Main Street this holiday season as we celebrate 71 years! The parade will run up West Main Street, cross over at Robins Street and come back up Jefferson Street.